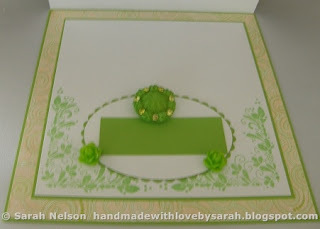 Handmade with Love by Sarah: Can you make a lime green wedding card? So this card started last Friday with a simple request, "Can you make me a wedding card by the 9th? The bride's favorite color is lime green." She also wanted to have their names and the wedding date included on the card. I said I would try...... I didn't have time to start working on this card until the morning of the 9th, so nothing like a little gotta get this done pressure to fuel the creative juices! 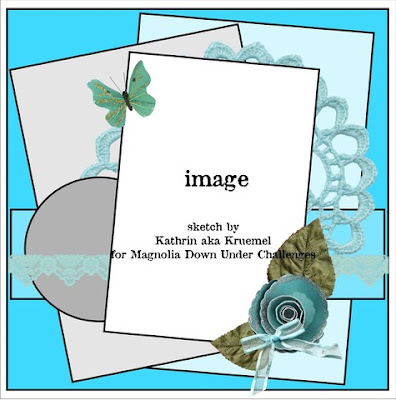 Now I like bright colors but I don't seem to use them a lot in cardmaking. To me, it seems that they can just be so overpowering if the proportions of bright and neutrals aren't just right. So, I turned to some Basic Grey papers that had some lime green in them, and just worked from there with a great sketch, and even managed to incorporate some challenges! Basic Grey #74: Bright and Bold I used Basic Grey "Gypsy" papers on my card. Here's Kathrin's sketch. I love all of the details she's included! 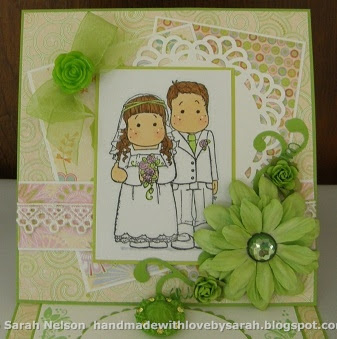 Here's my attempt at a lime green wedding card! Adding the names and date really was throwing me for a loop until I decided to make an easel style card. The green strip is to cover the couple's name and wedding date just for this blog posting. I printed out the names and date in a curly script font and then cut it out using a Nestabilities oval die. Here's the whole base of the easel card. You can see there's still a little white space so that a personal note can be written. Sorry that it is a little out of focus. I think the camera was fighting to focus on the swirly stuff and the sparkles on the button. Again, that strip of green paper is just for privacy while photographing this card for my blog. Ink: Memento Tuxedo Black, SU! "Garden Green"
Papers: White, lime green, dps from Basic Grey "Gypsy"
Other: MFT doily die, lime green organdy ribbon from Michael's, Bow Easy, vintage lime green button from Grandma's button stash, lace from stash, EK Success swirl punch, Copic markers, Nestabilities oval and petite scalloped oval dies. The lime green paper flowers, large green gem, roses, and epoxy roses are all from Recollections. My client was thrilled with the card, and I was thrilled to use up some supplies that I had been wondering how I'd ever manage to use! As someone who LOVES lime green I reckon this is FABULOUS! I can see why she was happy with it, such pretty embellishing and great idea to make it into an easel card, great idea just adding green touches to the bride and groom! Hi sweet Sarah: I actually love this wedding card. I can't imagine any bride not absolutely loving and cherishing a hand-made creation this beautiful. I didn't see you at Word Art Wednesday this week, and just wanted to stop by to say hello and make sure you, your husband and Ariel are all doing well. I hope you will be able to play along with us, and just wanted to let you know I'm thinking of you. This is adorable Sarah, your design is beautiful and your image adorable. I love all your delightful embellishments. Thanks so much for joining us with Basic Grey challenges.